What you are is what you have been. What you will be is what you do now. The first instance I know of (thanks to a helpful reader) is in Sogyal Rinpoche’s “Tibetan Book of Living and Dying,” which was published in 1992. I’m not sure where Sogyal got it from, but it’s simply not the kind of thing that the Buddha said and it doesn’t come from the Buddhist scriptures. I suspect that Sogyal was simply paraphrasing the Buddhist teaching of karma and that he (or his editor) chose to present his paraphrase as a quote. The quote is also internally inconsistent and incoherent. For consistency it should really say “What you are is what you have done. What you will be is what you do now.” The theme would then be that our actions shape who we are, which is a thoroughly Buddhist notion. Instead the first part of the quote is saying, in effect, what you were is what you are, which implies that you haven’t changed. The logical inference regarding the future would therefore be “what you are now is what you will be in the future.” That’s why I describe the quote as incoherent. So any brahmans & contemplatives who are of the doctrine & view that whatever an individual feels — pleasure, pain, neither pleasure-nor-pain — is entirely caused by what was done before — slip past what they themselves know, slip past what is agreed on by the world. Therefore I say that those brahmans & contemplatives are wrong. The point is that our present moment represents the confluence of what we have created in the past, with our present actions. To suggest that we are entirely “what we have done” is to ignore the possibility of our choosing, right now, how to relate to experiences that arise from the past. Source for that Nikaya quote? I added a link. Thanks for the reminder. This quote sounds a lot like Jiddu Krishnamurti ! I will find the source, but I think this is attributed to an early Kadampa Lama in the Lamrim. Also it seems a bit paraphrased. Well, I like sources! All the best with your search. This quote is from “The Tibetan Book of Living and Dying” on page 97 of the 2002 edition. He is quoting Buddha. Please do your research before making such a bold statement. Thanks for this. Google Books now shows the content of this book and I can confirm that the quote is in that book. (The quote is also internally inconsistent and incoherent. For consistency it should really say “What you are is what you have done. 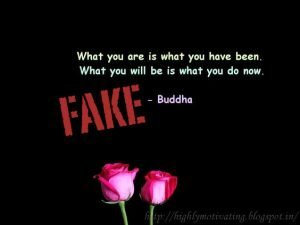 What you will be is what you do now.”) <—Not always. 'Cause not everything that has happened to someone is what that person has chosen. If what you have been is what you are now, then what you are now should logically be what you are in the future. If what you do now leads to what you will be, then what you are now should logically depend on what you did in the future. I’m talking about the internal logic of the quote. Whether what happens to you is what you have chosen isn’t relevant.